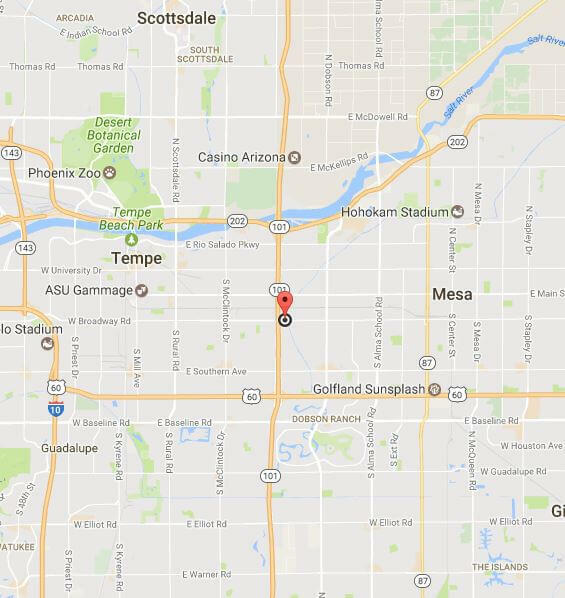 We are centrally located in Tempe near the West Mesa border to serve you better. 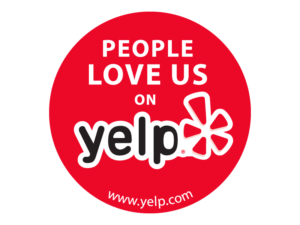 We serve all of the East Valley and Phoenix Metro area. If you are looking for quality auto repair or quality hyrbid auto repair in the East Valley, look no further than Good Works Auto Repair in Tempe. We are proudly serving Chandler, Tempe, Mesa, Gilbert, Queen Creek, Maricopa, Casa Grande, East Mesa, Scottsdale and students from ASU and MCC. 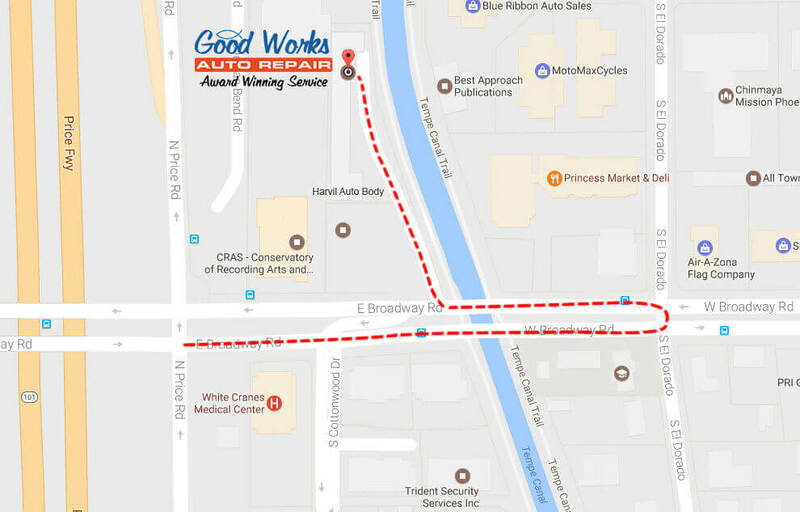 If you are looking for a friendly auto repair shop in Chandler look no further than Good Works Auto Repair in Tempe. If you need a quality hyrbid mechanic to run a hybrid battery diagnostic, Good Works Auto Repair in Tempe can help. Need to get a rental car in the east valley? Good Works Auto Repair can help with that too. From oil changes, transmission flushes, tires, power steering, break inspection, and hybrid battery reconditioning, Good Works Auto Repair can help you maintain and improve the performance of your east valley car. After spending almost 10 years on the mission field in Mexico, Glen Hayward returned to the states and settled in Phoenix. In 1989 he met RaeAnn at a local bowling alley and were married soon after. Ten years and three children later Glen and RaeAnn decided to open their own Auto Repair Facility. 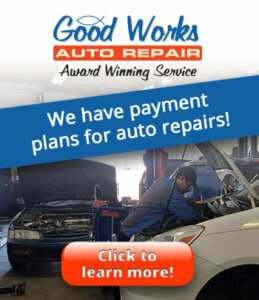 Using a home equity loan, they opened Good Works Auto Repair on July 19th 2004. In the beginning, it was only Glen, RaeAnn, their business partner Nathan Merrill, and one other employee. In 2012, they expanded the business from 3,000 sq ft to 7,000 sq ft and in 2013 became the 1st shop in AZ to partner with The Hybrid Shop to offer Hybrid Services to their community. In 2015, Glen bought out Nathan to became the sole owner of Good Works, and now Glen and RaeAnn have plans to add on another 3,000 sq ft later this year. Glen’s knowledge of cars (he’s been working in the field since he was a teenager) and his desire to help people is what drives the business and their mission statement… “To redefine the publics’ perception of our industry, by building relationships and delivering an exceptional service experience, one repair at a time!” This mission helped earn them the Tempe Chamber Small Business of the Year Award in 2015. Although Glen was originally from Wisconsin (and is a diehard Green Bay Packers fan), RaeAnn is a Phoenix native with strong family roots and deep ties to the community. This was particularly evident when RaeAnn was key in getting over 20 local auto repair shops to participate in the local Brakes for Breasts Campaign, which donated $20,000 to the Cleveland Clinic for Breast Cancer Research. They also regularly help with donations of time, money and even cars, to benefit several local schools, Helping Hands for Single Moms, Grace Community Church’s Single Moms Car Event, the Spina-Bifida Assoc. of AZ, Phoenix Children’s Hospital, Packages from Home, and many more. Although, Glen and RaeAnn rarely take the time to bowl anymore, they do enjoy participating in the worship band at The Bridge Church in Gilbert, hiking and traveling. They are members of their local Chambers of Commerce, have A+ ratings with the BBB, proud Members of the Network of Neighborhood Auto Repair Professionals (NARPRO), involved in several local business groups, Members of Local First, participate in the Arizona Trade Exchange, guest appearances and active in Bumper to Bumper Radio, Members of a National Mastermind Group with Automotive Training Institute, and volunteer with many local charity events including Safe Kids Car Seat Inspections, Feed My Starving Children, Car Seat Recycling, and Spina Bifida Walk n Roll. They believe if you work hard you too can achieve your dreams.